The story of the Interlake begins in 1933, one year after the birth of the Sandusky Sailing Club. A small group from the newly formed club began talking about a boat that would b e as swift as a family boat could be, uncomplicated, simpe to build , and above all as easy as possible on the pocketbook. A letter was written to designer Francis Sweisguth, of Rochester, NY. Sweisguth's most notable previous design was the Star, a boat that is still sailed in the Olympics today. Plans for a 22'6" keelboat that looked somewhat like a modern-day Crescent were returned. The lines were pleasing, but dockage rates at Battery Park in Sandusky were significantly higher for boats longer than 18 feet. (Rates for boats 18' and under were $.50/foot while those over 18' paid $2.50/foot. This, the magic number of 18' was suggested as a modified length to the original plans. It was also decided that a keel would not do in the shallow waters of the Bay, so a centerboard was substituted. In making these changes, Sweisguth also simplified the rig and enlarged the cockpit. 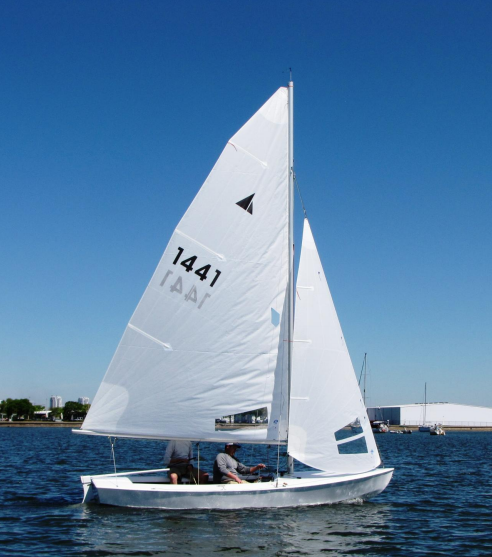 The resulting "SC2" (Sandusky Sailing Club Class) as it was first called, was characterized by a deep rocker designed to help the boat slice through the Sandusky Bay chop. It was initially agreed that the boat could be built commercially, but the spars and sails had to be made at home. The first professionally build hull (No. 2 for John Macleod) came as a hull and deck with beams installed and one coat of paint for $90. Five boats were sailing by the summer of 1935 and by 1936 there were 13 in all. By World War II, 90 had been built, and the class was going strong.